A child’s first remote controlled robot. 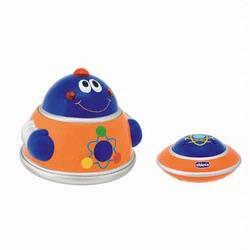 It moves with a funny swaying walk, accompanied by lights, sounds and giggles. Baby Space is ideal for the youngest of children because it is simply activated by pressing the large button on the infrared control unit.Award Winning Toy!